Light yellow in color, you do not expect a sherry. 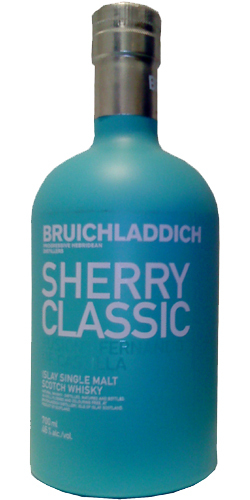 It smells fantastic, a typical Bruichladdich, soft, oak, little sherry, light smoke, great smell! That's the beauty of Bruichladdich. They have their own character. Neat start, it gets smokier, almost like bacon, spicy, fruity. In the finish, the sherry is well felt. Very fine fabric! Character: Fino, Palo Cortado and Manzanilla casks co-exist beautifully with the vanilla sweetness of Bourbon barrels. Nose: Close your eyes and inhale and you are immediately in Sanlucar de Barrameda enjoying tapas and a glass of chilled Manzanilla in the summer warmth of Andalucía. White raisins, sultanas & date syrup. Add a little water and these are joined by the light ruits of crisp sundried Scottisch barley. Finish: With 14 years average age this Laddie is in it's prime, strong yet gentle. There is a uniqueness about this spirit with the solidarity and variëty of sherry casks coming together.Mood: Siësta, laid back, mellow yellow, mañana, don't do today what you can put off until tomorrow. 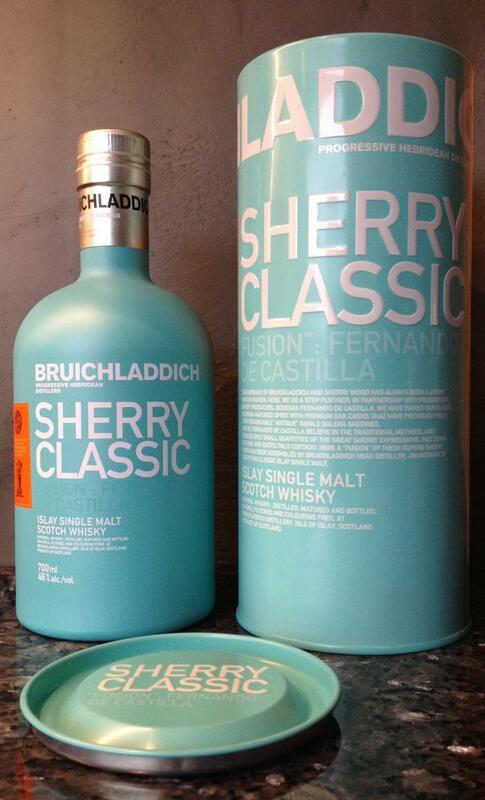 Bruichladdich 'Sherry Classic' (46%, OB, Fernando de Castilla Finish, +/- 2010) This baby was first matured in bourbon, and then finished in sherry casks. Not too sure about the age but probably quite young. Colour: straw. Nose: well, the sherry is light and does let the young spirit shine through, with the 'usual' peaches and melons as well as touches of graphite oil and paraffin. A little fresh butter too, maybe agaves and marzipan/almonds and just faint hints of beach sand. The whole is pleasantly light and fresh. Mouth: sweet, malty, fresh, fruity and slightly toasted/burnt (kirschy), maybe because it's still very young. Notes of berries, barley sugar, plum pie, then a little vanilla and just a few wee wine notes flying around. Also a little bubblegum. Finish: quite long, fruity, with a faint harshness in the aftertaste (kirsch again). Comments: I think this is classy spirit, I can't wait to try it at an older age and straight from good old refill wood! SGP:441 - 82 points. Sharp (perhaps because of the sherry finish), somewhat spicy, dry, not inviting. Tingling on the tip and on the sides at the back of the tongue. Sherry taste is clearly visible. Salty, vanilla, fruity.